It has been well documented that female athletes in general have been afforded lower salaries and less lucrative sponsorships. This can be attributed to lower TV viewership and lack of prime time coverage than their male counterparts in their respective sports. However, for the past few years, social media has provided a level playing field for all athletes — be it male or female. This doesn’t matter whether they play a sport that has a higher TV viewership or not, or even if they hail from a larger or smaller country. As long the athlete is exceptional at their sport and is social media savvy, they can promote their sponsors effectively. This allows them to drive as much or more fan engagement as their counterparts in more popular sports, regardless of gender. 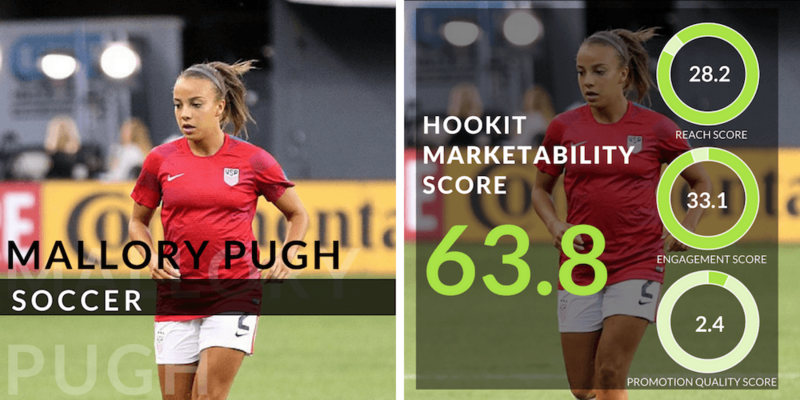 Early last month, SportsPro released its annual 50 most marketable athletes for 2018, that features for the first time, the Hookit Marketability Score as a measurement of an athlete’s social media acumen. 14 of the top 50 athletes on the list were women, each player unique in their contribution to their sport, and some of them trailblazers of a sport traditionally dominated by male athletes. How do we calculate this score? Reach score (max.score : 30) — The number of followers the athlete has. The scores are scaled by percentile of followers for all athletes. Engagement score (max.score : 35) — How engaged the athlete’s followers are on posts promoting brands and/or sponsors. 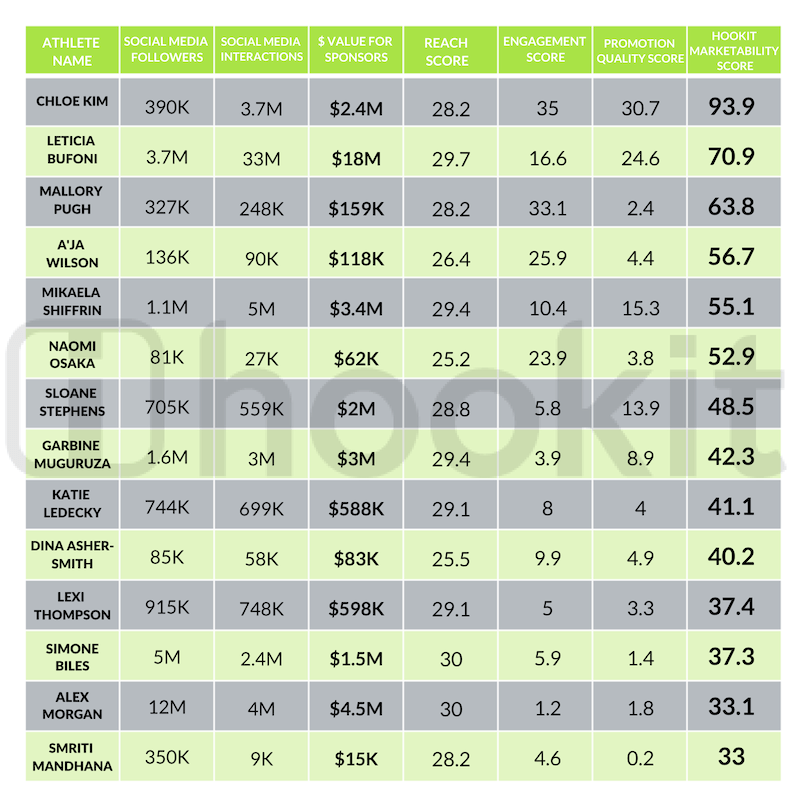 The engagement rate for each athlete was calculated based on all their promoted posts (average engagement per post/total number of followers). Promotion Quality score (max.score : 35) — The value that the athlete drives for brands in promoted posts. While value depends on follower reach and engagement, promotion quality considers both to determine the value per follower, the rationale being that if an athlete is able to drive more value per follower, they are a more effective ambassador for their brand sponsors and will help return greater ROI. 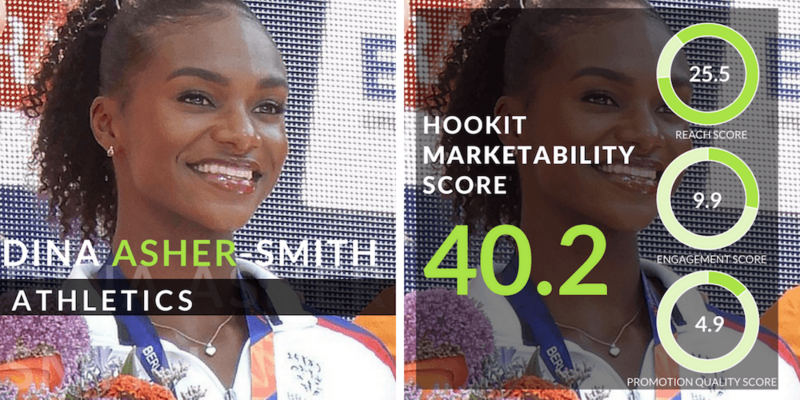 Hookit’s in-depth look by athlete, helps understand the areas where the athlete scored and where they fell short, as well as the factors that contributed to their overall marketability score. Women’s cricket matches were usually relegated to the background and mentioned in sports columns as an afterthought. But, at the 2017 ICC Women’s World Cup, although the Indian team lost the championship to England by a meager 9 runs, it was a day of victory for not just the Indian women’s cricket team, but for women’s cricket in general. As part of this World Cup team roster, this was just another feather in the cap for promising cricketer Smriti Mandhana. The current vice captain of the women’s T20I team is also the latest recipient of the prestigious Arjuna award, which celebrates outstanding achievement by a sportsperson in their field. With a growing list of achievements to her name on field, off field on social media, she has a solid social media presence with over 350k followers across her social channels. This number is just a fraction of the followers her male counterparts command, but is significant, as women’s cricket is yet to reach the same level of popularity and fan base as the men’s team. 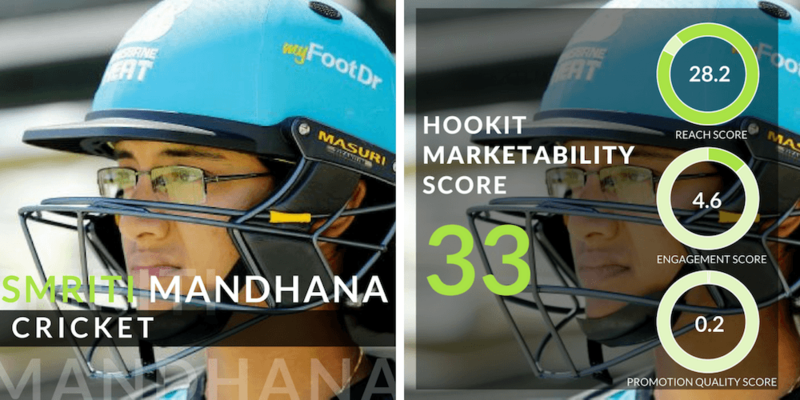 Smriti Mandhana scored high on her reach score, but dropped significantly in her engagement and promotion quality scores. She has a good follower base across her social channels, but she has lower engagement with them on her promoted posts, leading to a lower engagement score. Also, she only promoted her sponsors twice in the entire time period, for a total value of $15k (value per post of $7.5k) leading to lower promotion quality score. Good social media follower base, but needs to be more engaging with followers and promote sponsors more. Widely considered a soccer icon and a global celebrity in her own right, Alex Morgan, the Olympic gold medallist and FIFA Women’s World Cup champion is now synonymous with women’s soccer in the US. Currently the Global athlete ambassador of UNICEF and a member of the defending World cup champions, her influence is only expected to grow even further going into the 2020 Olympics. 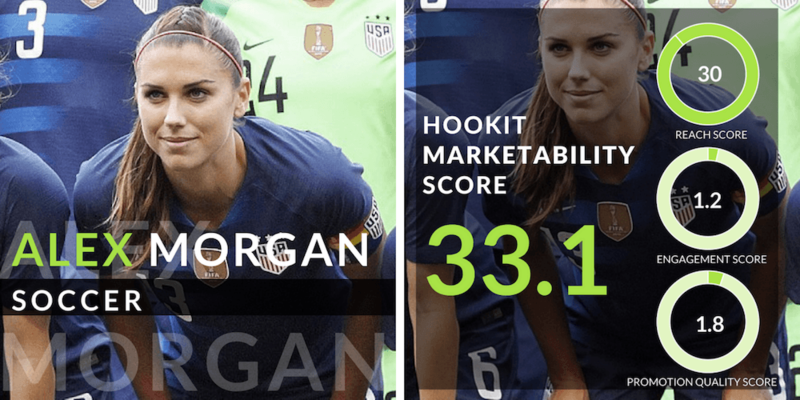 With more than 12M followers across her social channels, Alex Morgan has the highest number of social media followers among the most marketable female athletes, leading to a perfect reach score. However, her scores are lower on follower engagement and the promotion quality of posts. During the time period, although she promoted her sponsors 95 times, she only earned a total media value of $4.5M. 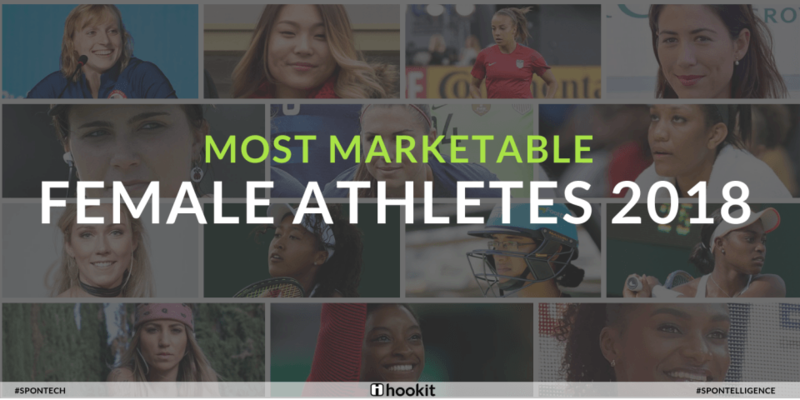 Lower engagement rate and less value per follower have led to lower engagement and promotion quality scores and the second lowest Hookit Marketability score among the female athletes. A large follower base on social media is by itself not enough — better engagement with followers is essential to drive value for sponsors. 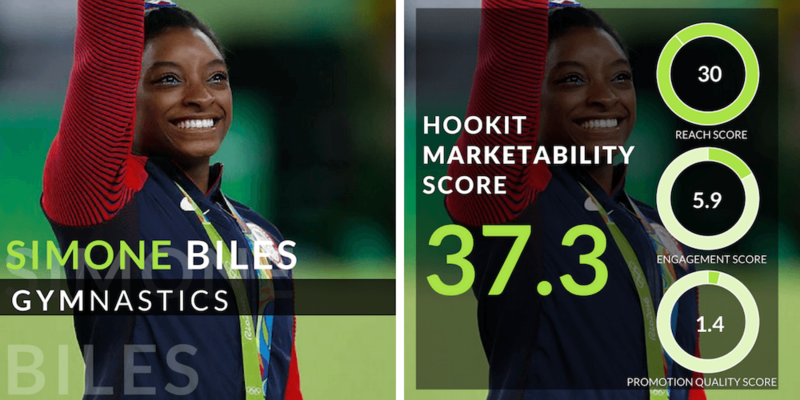 One of the most decorated American gymnasts, Simone Biles has a multitude of wins to her name. She has won a combined total of nineteen Olympic and World Championship medals and is the first American woman gymnast to win four gold medals at a single Olympics. With 5M social media followers, Simone Biles has the second highest social media followers among the women athletes. However, the engagement with her followers is lower. She promoted her sponsors on her social media channels through 27 promoted posts driving an earned media value of $1.5M. Has a huge follower base on social media. However, engagement with followers and promotion of sponsors needs improvement. Lexi Thompson, one of the most recognizable stars of golf and the top ranked American golfer of the LPGA, has been competing as a pro since she was 15 years old. She has won 9 LPGA tournaments until now; one of which is a major championship, and has endorsement deals from Red Bull, Rolex, Lexus and others. 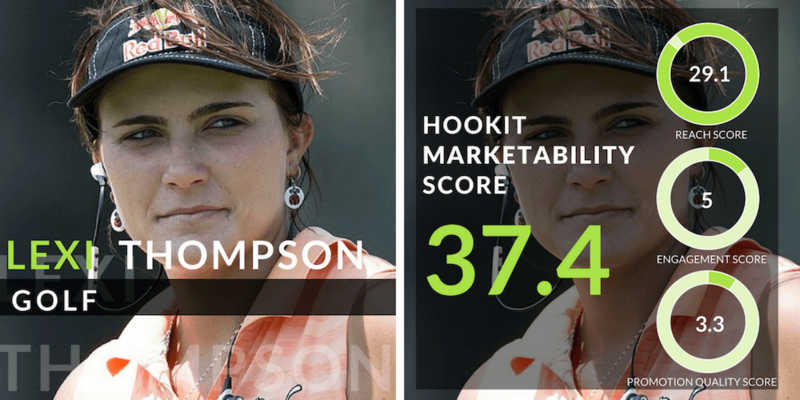 Lexi Thompson has 915k followers across her social channels, but had a lower engagement with her followers on promoted posts. She drove $598k in total value for her sponsors through 57 promoted posts but received a lower promotion quality score due to low value per follower. Has a good follower base on social media and promotes sponsors well. An increase in engagement will result in more value for sponsors. The young British sprinter is a force on the track, with a long list of top world championships to her name. She has won the 2018 European Championship in 100m and 200m, the gold medals at the 2018 Commonwealth Games and the 2016 200m European Championship along with a bronze medal at the 2016 Olympics. Off track on social media, with 85k followers on social media, she has one of the lowest follower counts among the other most marketable women athletes. However, she had good engagement with her followers on her promoted posts and promoted her sponsors 24 times over the considered time period. The total value she drove for her sponsors was over $83k. Good engagement with followers and promotes sponsors well, but needs to grow her social media follower base to increase impact. With 5 Olympic gold medals and 14 world championship gold medals to her name, Katie Ledecky has been crushing her opponents from the day she debuted on the international scene. At just 21 years old, she is the current world record holder in the women’s 400m, 800m and 1500m freestyle and shows no signs of stopping leading into Tokyo 2020. 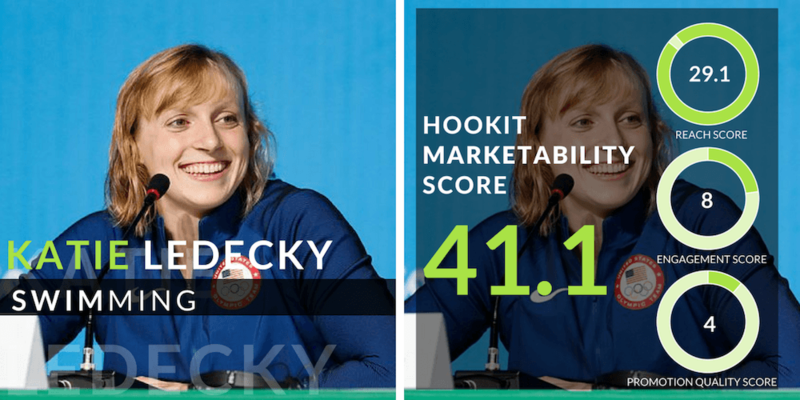 With 744k followers across her social channels, Ledecky has lower number of followers on social media than other female athletes on the list. However, she promoted her sponsors 41 times, driving a total value of $14M. She also had good engagement on those promoted posts, leading to good engagement and promotion quality scores. Has a smaller follower base on social media, but promotes her sponsors well and has good engagement with followers. The winner of the 2016 French Open and 2017 Wimbledon championship, Garbiñe Muguruza has six WTA titles to her name. With second round exits in 3 of the 4 majors and a semi-final loss in the French Open, 2018 may have been an average year on court for the Spaniard, but she shows no signs of slowing down both on and off the court. With 1.6M followers across her social channels, Garbiñe Muguruza has a good follower base leading to a high reach score. She also promoted her sponsors well on social media — with 164 promoted posts, she drove a total value of $2.9M for her sponsors, leading to higher promotion quality score. Has a good follower base on social media and promotes sponsors well, but needs to drive more engagement. Sloane Stephens, the 2017 US Open champion, and 2018 French Open finalist reached a career-best ranking of World №3 during the summer of 2018. She rose to prominence during the 2013 Australian Open with her quarterfinal win over Serena Williams and has continued her upward trajectory in the sport by winning six WTA titles since. 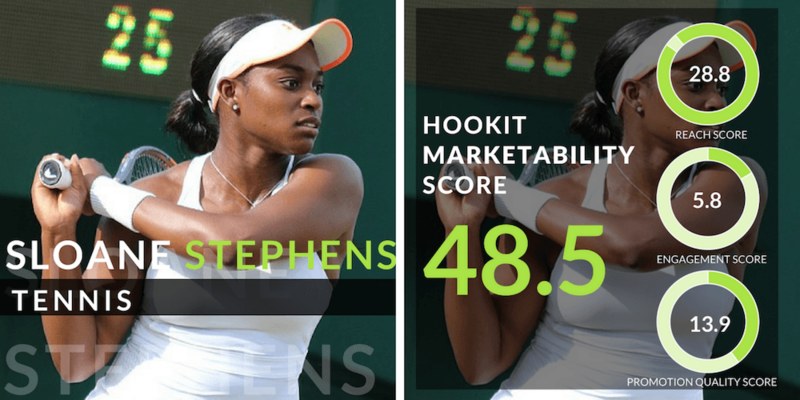 Stephens has over 705k social media followers, but has lower follower engagement. However, she steadily promoted her sponsors through 48 promoted posts, driving an earned media value of $2M. This lead to a higher value per post and higher promotion quality score. Smaller follower base and low engagement with social media followers, but promotes sponsors more and adds more value for sponsors. 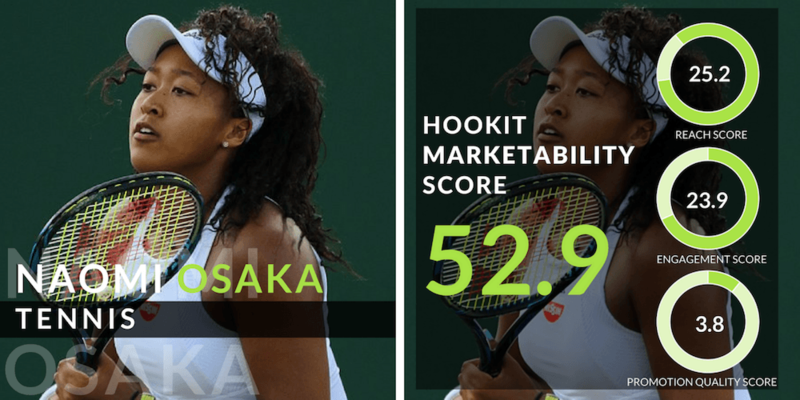 A rising star until the US Open, Naomi Osaka is now one of the top players at her game. Despite the controversy on court and lack of crowd support during the 2018 US Open championship, Naomi Osaka maintained her composure and won her career first grand slam, which also propelled her to the top 10 in the WTA world ranking. She currently has endorsement deals from Adidas, Nissin, Citizen and Yonex among others. Naomi Osaka has a lower follower base* on social media compared to other women athletes on the list. However, these are highly engaged followers, contributing to a higher engagement score for Naomi. She promoted her sponsors only 5 times during the time period for a total value of $12k, leading to lower promotion quality score. Has a smaller follower base, but one that is highly engaged. Needs to promote sponsors more often to drive more value for sponsors. *After the US Open her follower base has increased significantly to 1.1M. Two-time Olympic gold medallist and reigning overall World cup champion in skiing, Mikaela Shiffrin is undoubtedly a phenomenon on the slopes. At just 23 years old, she is widely considered the future face of women’s skiing and is well on her way to dethrone Lindsey Vonn, the reigning queen of the slopes. Shiffrin has an engaged social media audience of over 1.1M social media followers. She also drove a total value of $3.4M for her sponsors through 157 promoted posts, generating higher engagement and promotion quality scores. The 2018 WNBA All-Star, 2018 Rookie of the Year and winner of all six national player of the year awards, A’ja Wilson has been an unstoppable force on court. Selected by the Las Vegas Aces as the overall first draft pick of the WNBA, and looking to win a gold as part of the US Women’s National Team at Tokyo 2020, A’ja Wilson’s time in the spotlight is only just beginning. 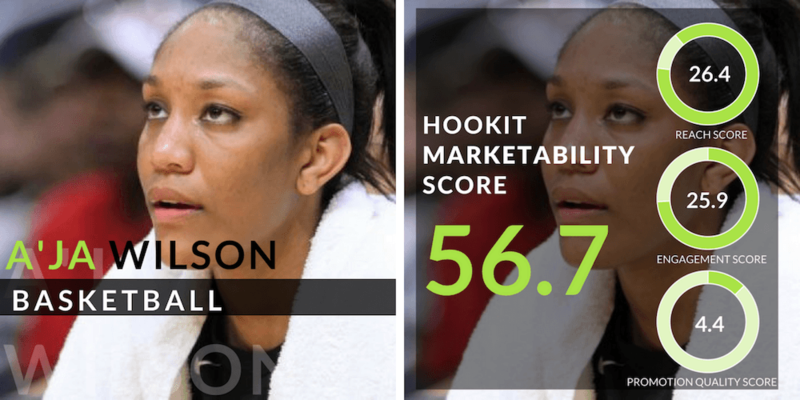 Though A’ja Wilson’s social media followers may be lower than the other female athletes on the list, she has a higher engagement with her 136k social media followers. However, she promoted her sponsors only 9 times during the time period for a total value of $118k leading to a lower promotion quality score. Good follower base and great engagement with social media followers, but needs to promote sponsors more to add more value for sponsors. In 2016, the now 20 year old rising soccer star was the youngest to be selected to play for the US National Team in an Olympic event. Later that year, with her goal against Columbia at the 2016 Olympics, she became the youngest player to ever score a goal for the United States in the Olympics. Today, she is considered the next soccer star of the US and her influence on field continues to grow. On social media, she has a highly engaged social media follower base of over 327k followers. With an engagement score of 33.1, she has one of the highest engagement scores among the female athletes (Chloe Kim is the only other female athlete higher than her with a perfect score of 35). However, she only promoted her sponsors 8 times during the time period for a total value of $159k, leading to lower value per follower and a lower promotion quality score. Great engagement with social media followers, but needs to promote sponsors more to increase value for sponsors. Widely considered a sport dominated by male athletes, Brazilian Leticia Bufoni has become THE trailblazer for women in skateboarding today. A four time X Games gold medallist and the first ever women’s Super Crown Champion in Street League Skateboarding, she has her own national show in Brazil called “Leticia Let’s Go” and was named one of Forbes most powerful women in International sports in 2018. 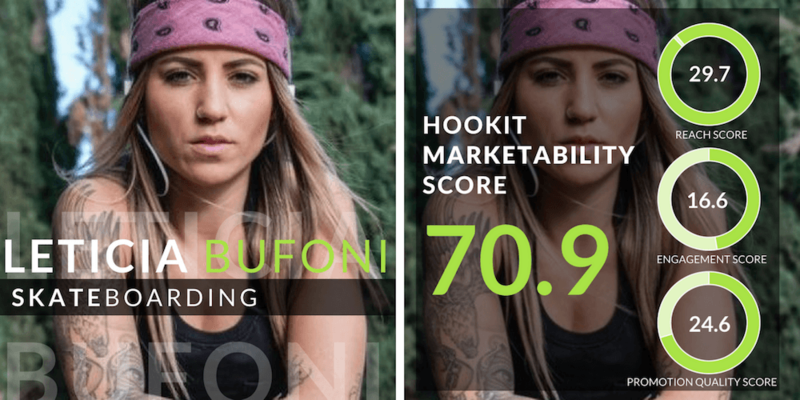 Leticia Bufoni is one of the most socially savvy athletes today and uses her social media channels most effectively to promote her sponsors. She has more than 3M followers across her social channels and high engagement with her followers. During the time period under consideration, she had 189 social media posts promoting her sponsors, and drove a total value of $18M for her sponsors — the highest value among the female athletes on the list. 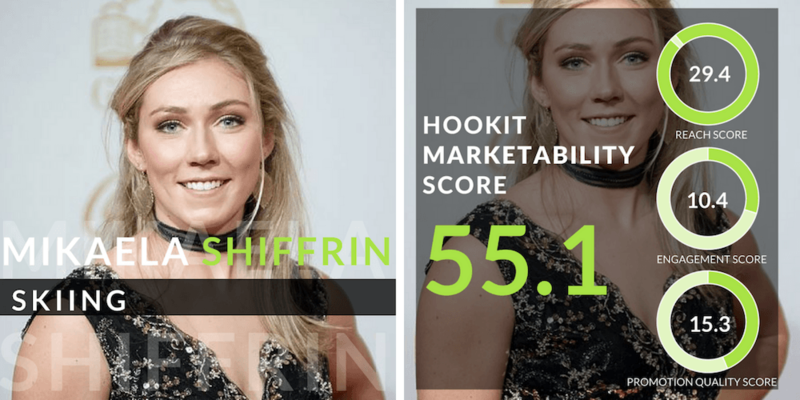 She also holds the 7th place overall among the most marketable athletes (and 2nd among female athletes), if scored only based on the Hookit Marketability score. Large social media follower base, great engagement with followers and best promotion of sponsors. Chloe Kim was relatively unknown by the international community until her debut at the Winter Olympic games in 2018, where she won gold for the women’s snowboard halfpipe. Her fun personality made her an easy social media star and after her Olympic gold medal win, her social media followers increased by 8 times — from 20k to 170k. Chloe Kim is undoubtedly the queen of social media and she has the overall highest Hookit Marketability score among all the athletes. She also has a very highly engaged audience of over 390k followers across her social channels. She was the only female athlete to get a perfect engagement score, while her 65 promoted posts drove a value of $2.3M for her sponsors. Her value driven per follower was also the highest at $6.15 per follower, leading to a high promotion quality score. Lower follower base on social media, but highly engaged with social media followers and drives high value for sponsors. It can be seen that all three factors — Reach, Engagement and Promotion Quality, together create a significant value addition to the athlete. It is not enough for an athlete to just have a large social media following, the athlete should be able to engage effectively with her followers and promote her sponsors more often, to improve engagement and promotion quality. Athletes like Chloe Kim and Leticia Bufoni now demonstrate that women can drive just as much, if not more fan engagement and sponsor value than their male counterparts, sometimes even more than those in more mainstream sports. 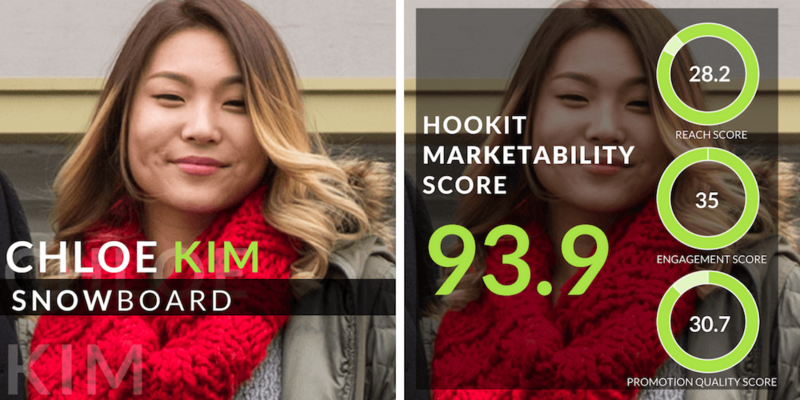 Learn more about Hookit’s Marketability score and what Hookit can do for you! All data from Hookit. Athlete images from wikipedia. Images of Leticia Bufoni and Smriti Mandhana from SportPro.